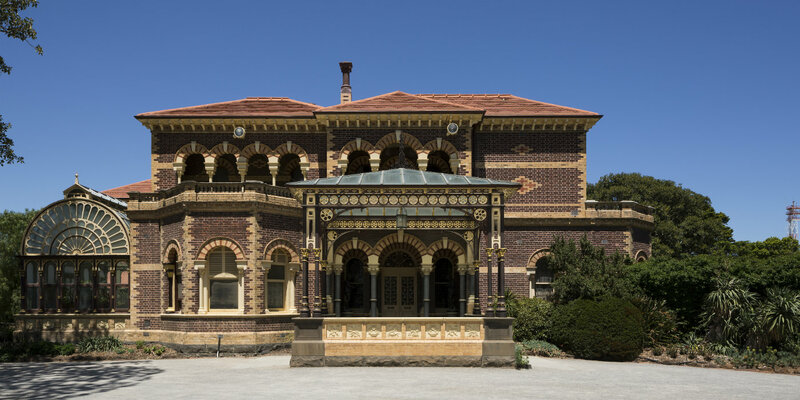 Rippon Lea Estate is a historic mansion that was built for Frederick Sargood in 1868 and is located in Elsternwick, just 12kms south west of the CBD. The estate was named after the owner’s mother whose maiden name was Rippon. The word ‘Lea’ is an English word for ‘meadow’. On arrival, the gates open up to an expansive property that is nestled in lush sweeping lawns which cover an area of up to 14 acres. The 19th Century mansion stands out because its rich heritage traces its opulence to a time when its owners led a lavish lifestyle. A tour of the mansion at Rippon Lea Estate gives you a glimpse into the architectural style of the past. A visit to the basement kitchen complex and expansive bathrooms is testament to this. Additionally, you will also notice the elaborate entertainment complex, the ironwork at the conservatory as well as the intricate interior in the dining area. Visitors should note that access to the inside of the mansion is by tour only which can be booked at the gatehouse. Get there early, as they do book out during peak times. After a tour of the mansion, make your way to the verdant gardens and enjoy a walk around the facility. Climb the lookout tower to enjoy sweeping views of the property, or relax on the lawns. Other attractions on location include a windmill, a fernery, a lake as well as a heritage orchard. Please note that dogs are not permitted on the estate, with the exception of service dogs. Don’t pass up the opportunity to enjoy a cup of coffee and fresh sandwich at the Gate House. The estate is open to the public, both for tours and events. Parking is not available on the grounds of the estate, but nearby. Popular as a wedding venue, Rippon Lea Estate is a great place to host your wedding with a historic building, picturesque gardens and ornamental lake. Weddings with guests up to 200 people can be accommodated on the expansive grounds. An outside ceremony costs around $1500 for 2 hours with additional hours for a ceremony or reception in the grounds is $750 per hour. A wedding inside the ballroom costs more, so contact the estate to make an enquiry. If you are simply after wedding photography in the gardens, the cost is $750. To get to Rippon Lea Estate, catch a tram on the Sandringham line and alight at Rippon Lea Station, which is ljust a short 5 minute walk away. Alternatively, take a tram on route #67 and alight at stop #42.